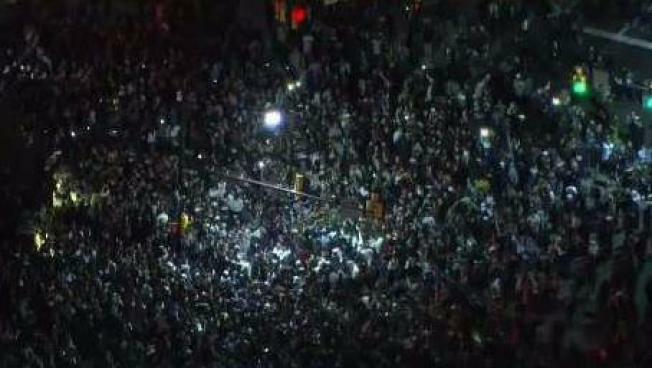 Students poured out into the streets to celebrate as the Villanova Wildcats won their second national title in three years after beating the Michigan Wolverines 79 to 62. Villanova players flash their fingers in a "V'' symbol to celebrate big wins. For coach Jay Wright, that's a finger for every national championship ring. Already cemented as a dominant program in college basketball, the Wildcats are flirting with putting their names on a more opulent D-list: dynasty. The Wildcats' romp through the NCAA Tournament that ended Monday with a second national title in three seasons has them up for debate as one of the top programs since the tourney field was expanded to 64 teams in 1985. You know, the year the Wildcats won their first national title. There's plenty of time to talk about Villanova's place in history after the partying is done this week. 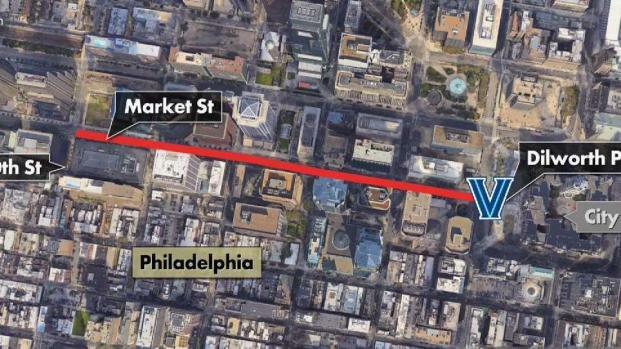 The Wildcats were to return home to a raucous celebration at their suburban campus on Tuesday and a parade was planned for Thursday in downtown Philadelphia just hours before the Phillies' home opener. Parades have suddenly become a thing in Philly. Jalen Brunson, Mikal Bridges and breakout star Donte DiVincenzo helped the Wildcats win all six tournament games by double digits, joining Michigan State in 2000, Duke in 2001 and North Carolina in 2009. Villanova also joined the 1968 UCLA team as the only ones to win both their Final Four games by 16 or more points. "I knew we were good, but you don't think we can win this," Wright said. He should know they can: The Wildcats set a program best in wins (36-4) and won an NCAA-record 136 games over a four-year span. — In the post-John Wooden/UCLA era, only three other teams have won two titles in three seasons: Duke in 1991 and 1992, Florida in 2006 and 2007 and Kentucky in 1996 and 1998. 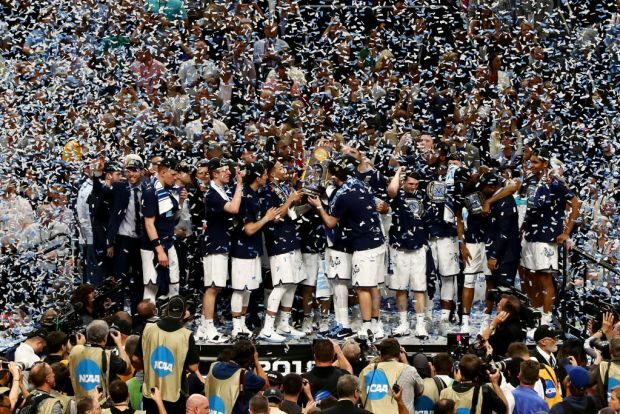 Villanova became just the ninth program to win three championships (1985 and '16) and has made three Final Fours since 2009. — In the last five seasons, the Wildcats have four regular-season Big East titles, three Big East tournament titles and two national championships. The list of accolades under Wright stretches longer than the combined distance of the Final Four-record 18 3-pointers hit against Kansas in Saturday's national semifinals. Wright leads a loaded roster fully positioned to go back-to-back and show college basketball that Duke and Kentucky and Kansas and North Carolina can all be rolled into one program nestled in the Philadelphia suburbs. The Wildcats had no seniors in their rotation and should return a nice chunk of their roster. But Brunson, the AP player of the year , and Bridges are both likely to declare for the NBA draft. Brunson already has two championship rings and more hardware from his various player-of-the-year awards than he can carry, and he is set to follow his dad, Rick Brunson, into the NBA. Bridges has played his way into becoming a likely NBA draft lottery pick and should make a serviceable pro. Brunson and Bridges would leave a considerable void in the lineup and be on the small list of 'Nova players under Wright who left early for the NBA. Hey, it worked out fine for Kyle Lowry. DiVincenzo, Eric Paschall, Omari Spellman and Phil Booth are all expected to be in the starting lineup and joined by five-star point guard Jahvon Quinerly. Quinerly is one of Wright's more anticipated and prized recruits in his 17 years at Villanova. Quinerly was set to attend Arizona until he reopened his recruitment in the wake of a federal probe. Cole Swider and Brandon Slater are also prized incoming freshmen expected to help. Throw in Collin Gillespie, Dhamir Cosby-Roundtree and Jermaine Samuels, and the Wildcats should keep rolling as national championship favorites. Wright's success has again made his future a hot topic at Villanova. He's said many times he wouldn't leave 'Nova for another college job, and with good reason. He's turned the Wildcats into a dynasty even Blake Carrington would envy, and the program is set to move into its $60 million state-of-the-art renovated on-campus arena next season following a year of playing at the Wells Fargo Center, home of the Philadelphia 76ers. Wright, who made $2.6 million this season, is King of the Cats and he's pretty much guaranteed a job for life at Villanova. But the NBA is a different story. He's resisted overtures from NBA teams in the past but if the situation — and the cash — was right, the coach dubbed "GQ Jay" could be swayed to leave his cushy gig in the tony Philly 'burbs. The magic eight ball says he'll stay — but what's left to accomplish? The Wildcats will have to decide if they'll visit the White House for a championship celebration should they be extended an invitation from President Donald Trump. The Villanova Wildcats men's basketball team will get their fair share of brotherly love in a parade set for Thursday. With the hype of another championship in the Philadelphia area, the city expects the route to be equally as packed as before. Wright once worked in the marketing department for the Philadelphia Stars of the United States Football League and Trump owned the New Jersey Generals in the ill-fated league. "When they signed Herschel Walker, they had a press conference and the Stars sent me up to represent them," Wright said. "I met Trump there. In the USFL championship game, the Stars owner asked me to work and be a runner for Trump in his box. He was very cool, very nice guy. He was relaxed. But when they signed Herschel Walker, he was very businesslike, very professional. That was a big day for him and the league." The Wildcats thumped Kansas in the Final Four and the two powerhouse programs will get an immediate rematch in 2018. Villanova will play Dec. 15 at Kansas.